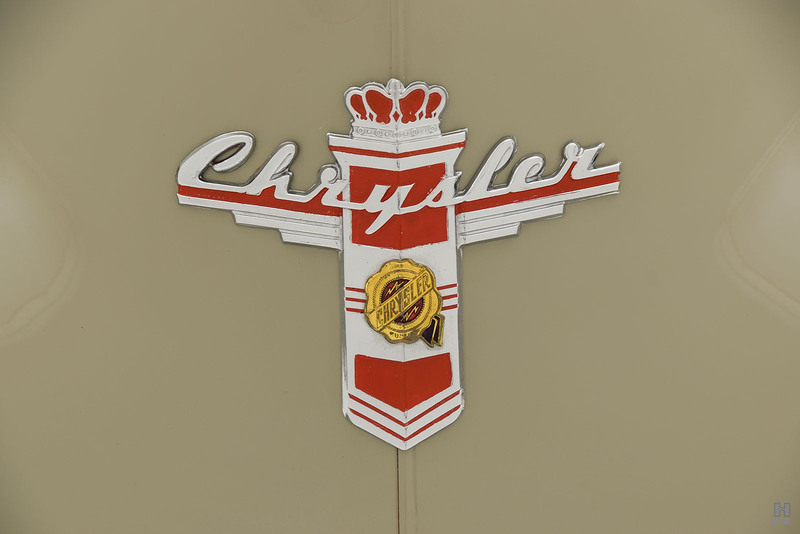 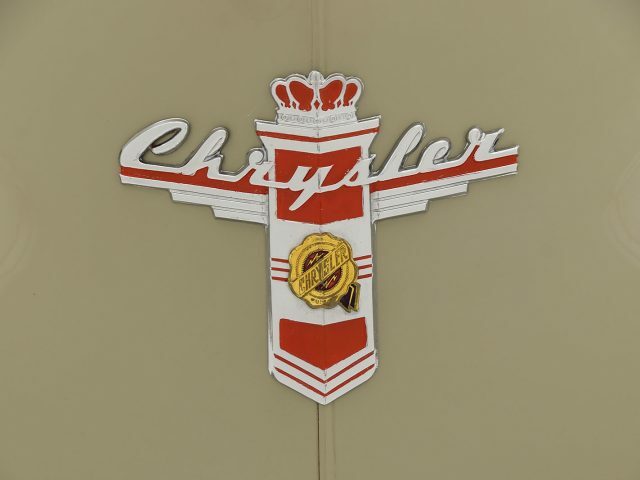 Well before the moratorium on civilian car production in 1942, Chrysler Corporation had substantial involvement in supporting the war effort. 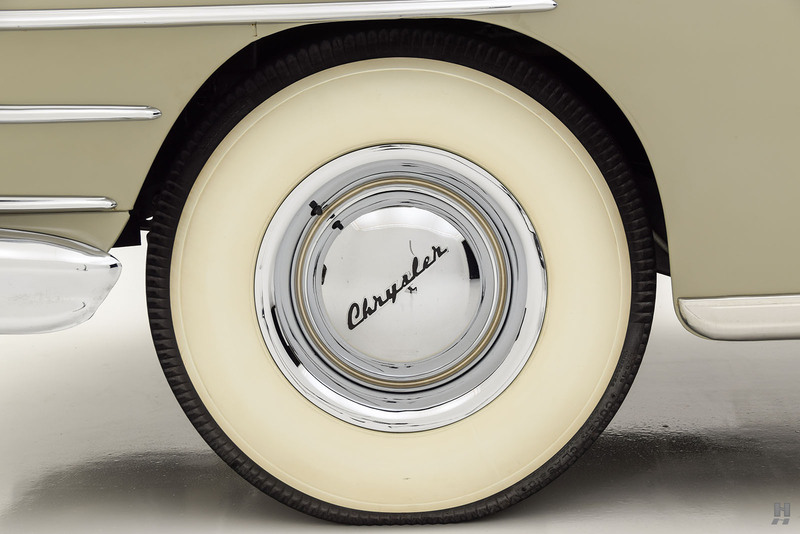 Chrysler powered machines served in harsh environments all around the world, and their achievements were not lost on the buying public after the war. 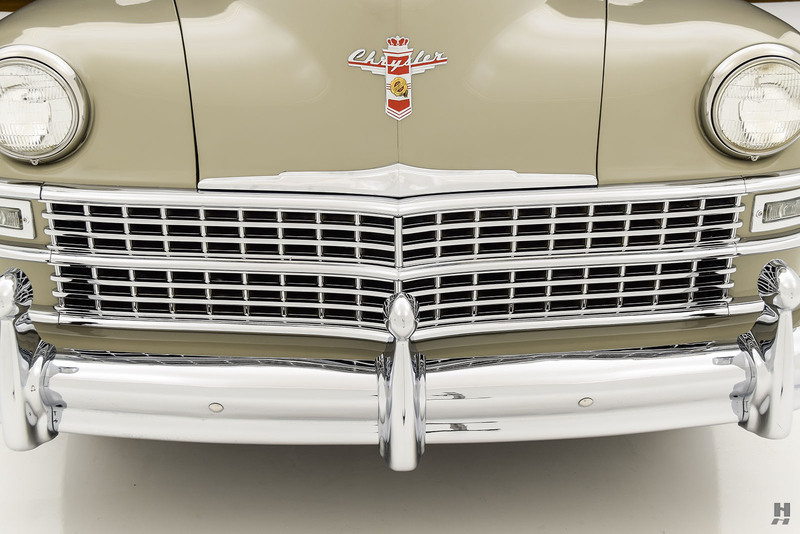 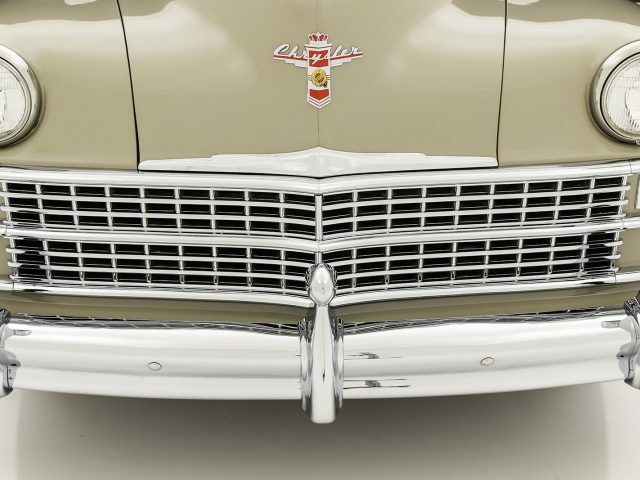 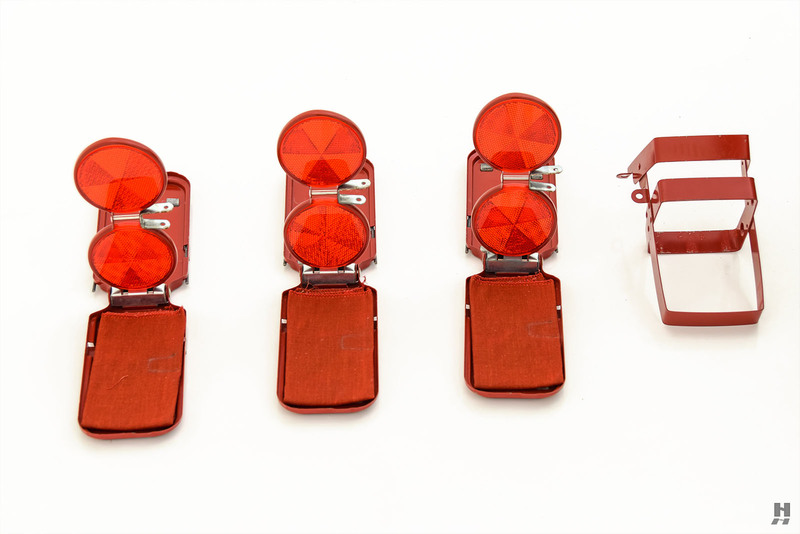 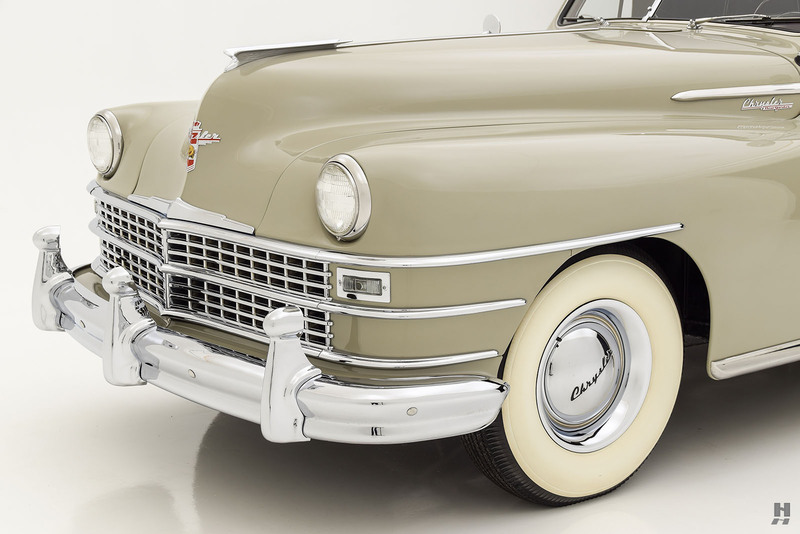 Once plans were made to resume production, material shortages and tooling delays meant the first cars didn’t roll off the line until 1946, based heavily on existing 1942 designs but with refined looks based around a fresh new grille. 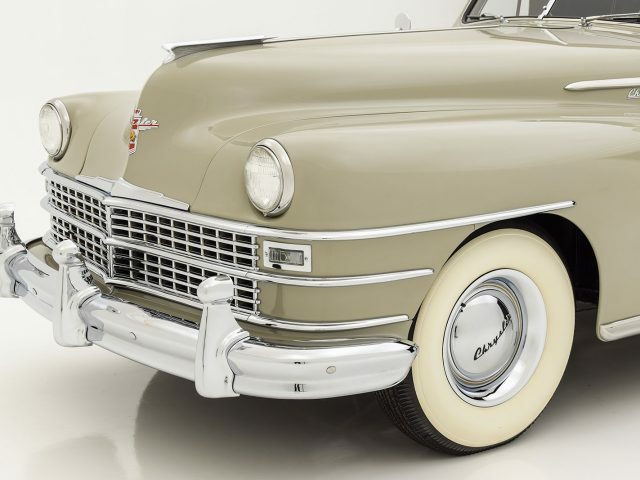 Post-War demand for their cars was so high that between 1946 and 1949 Chrysler hardly changed the styling for fears of losing the tremendous sales momentum they enjoyed. 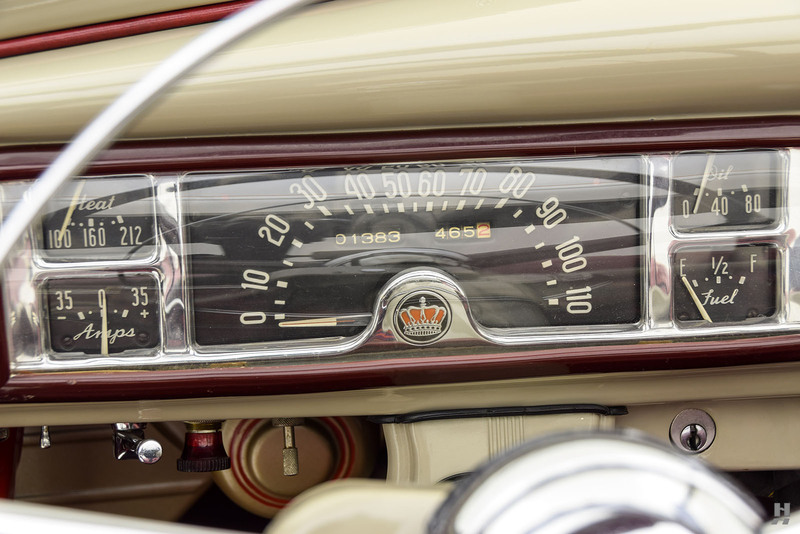 At the bottom of the lineup were the six-cylinder Royal and Windsor series cars. 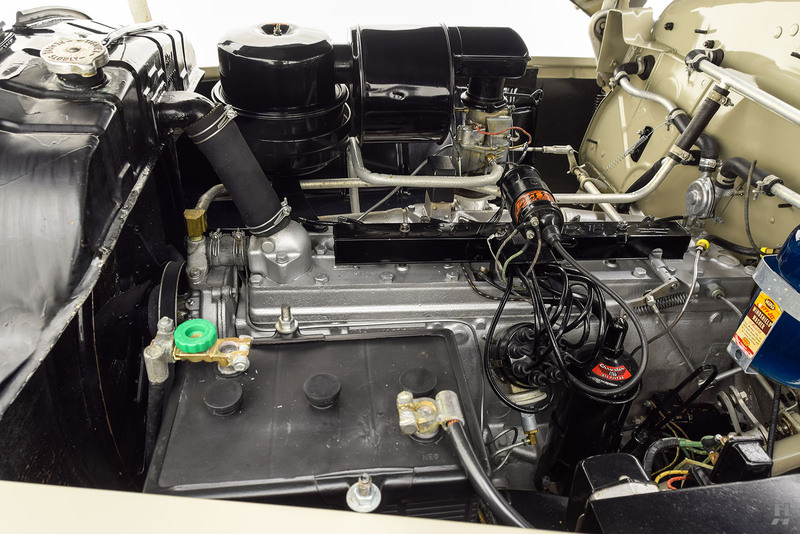 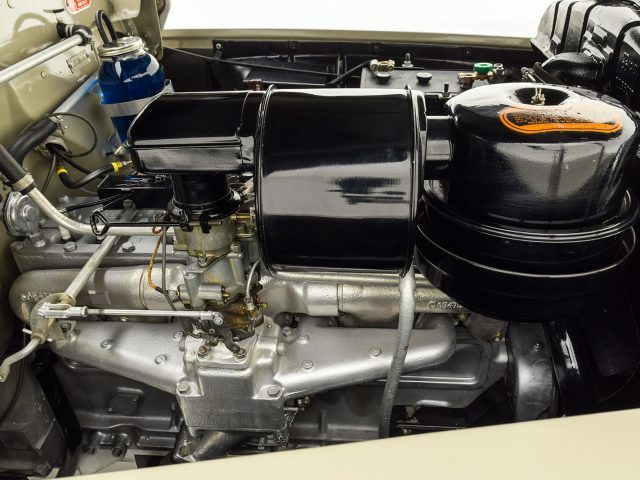 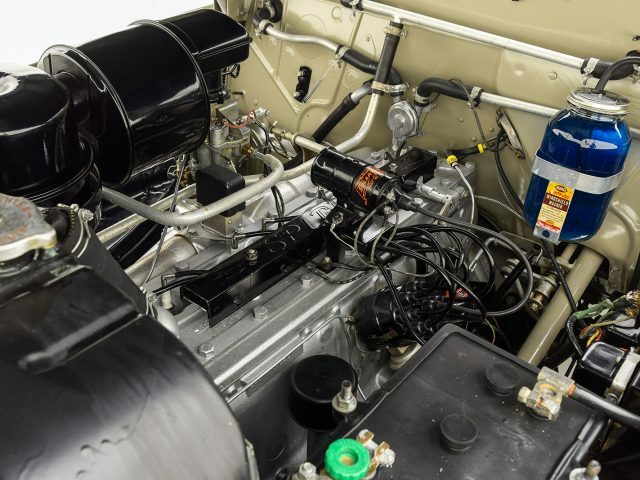 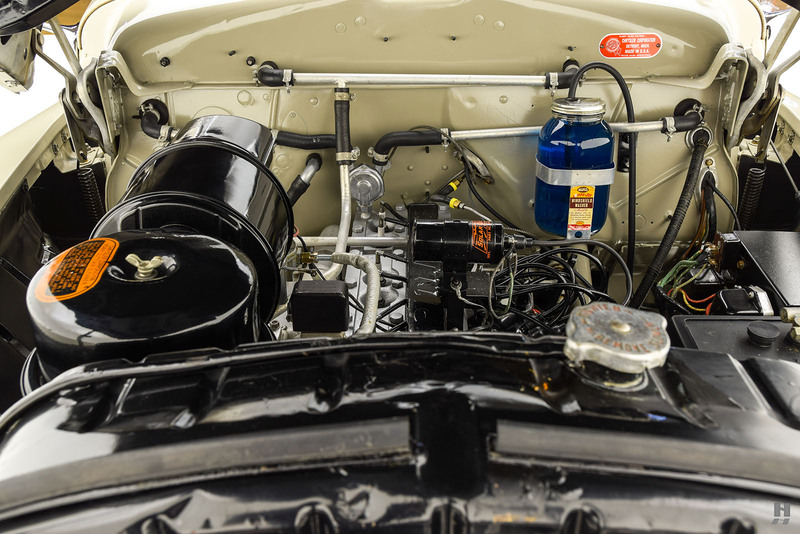 Chrysler’s flathead inline-six proved to be an incredibly robust engine, with military versions powering a wide array of vehicles throughout the war. 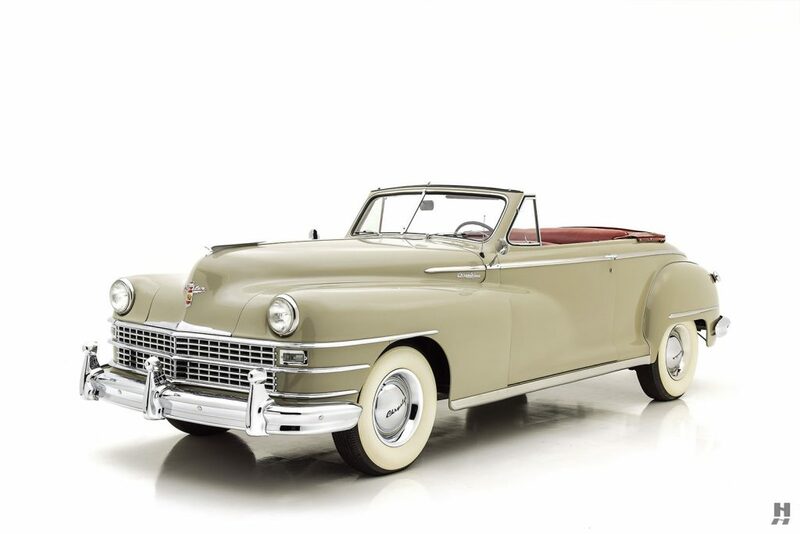 Stepping up from the Windsor was the Saratoga, which served as the introductory eight-cylinder model, sitting on a stretched 127.5-inch wheelbase chassis to make room for the longer engine. 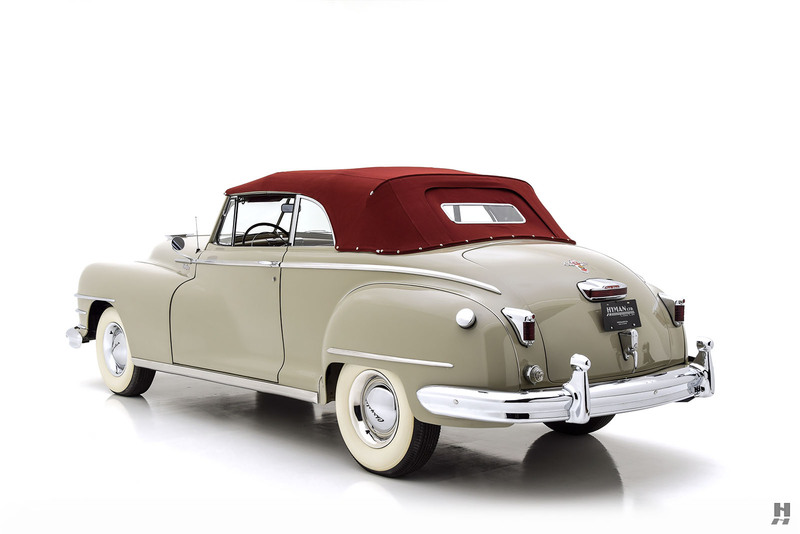 Making a big leap from the Saratoga was the flagship New Yorker, with 1946 marking the first year the New Yorker label applied to a standalone model. 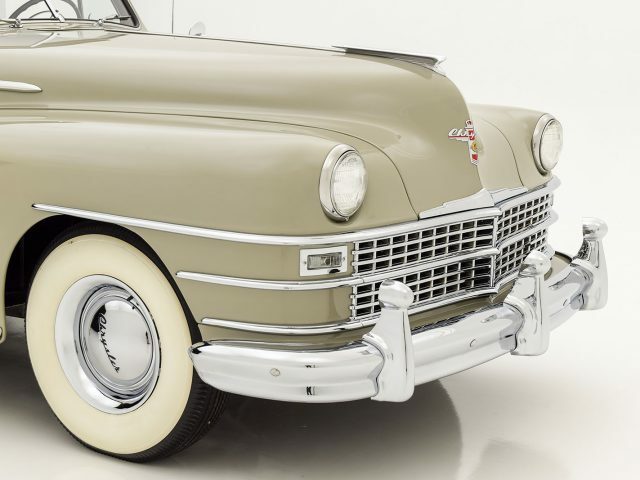 The 8-cylinder New Yorker featured everything in Chrysler’s bag of tricks, with the Fluid-Drive transmission mated to the inline-eight, and a host of available comfort options. 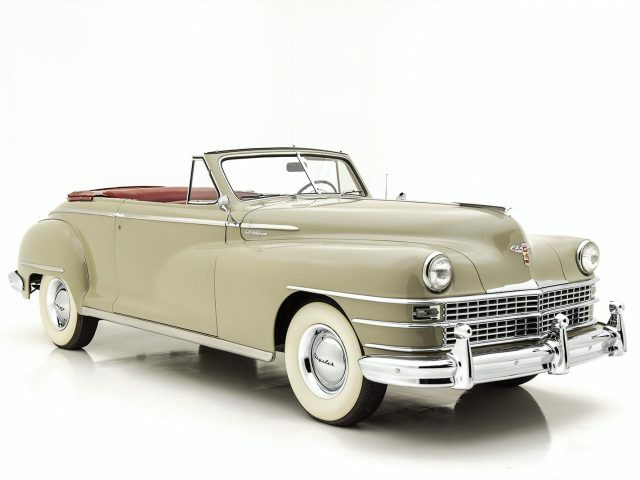 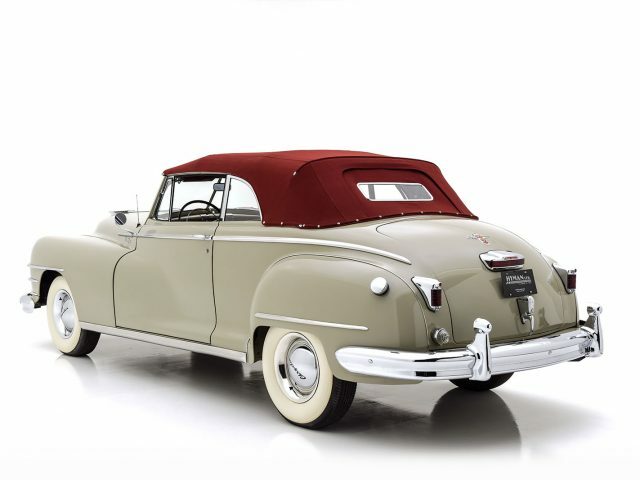 The 1946 Model year also saw the continuation of the wood-bodied Town & Country, now available as a convertible for the first time, and classified as a trim package within the New Yorker line. 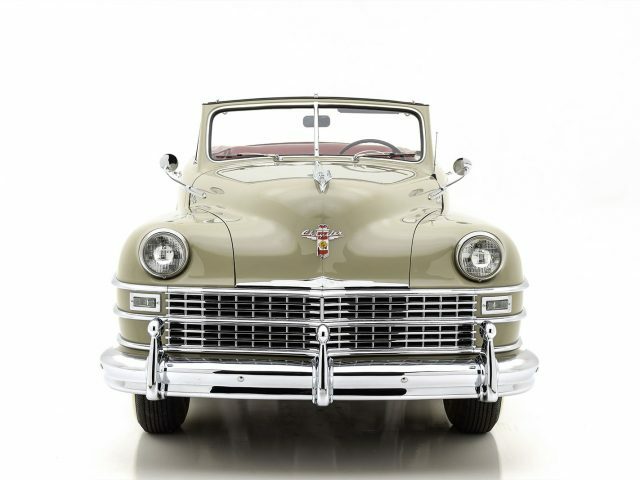 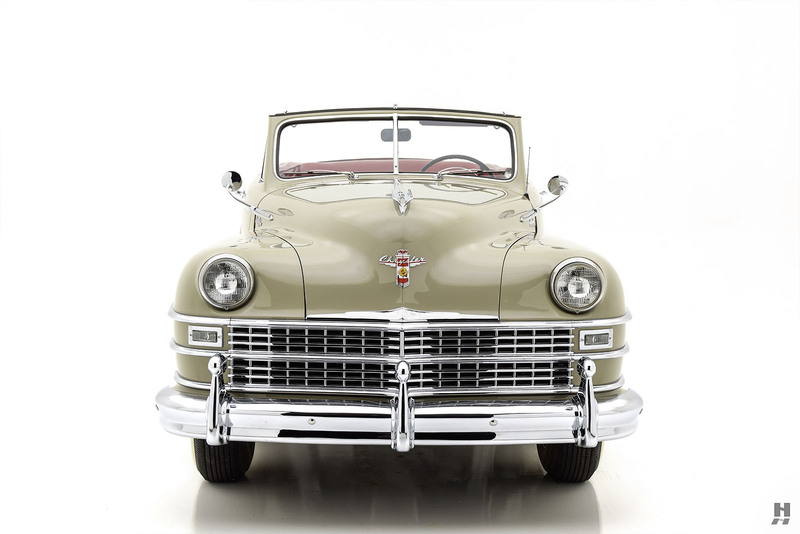 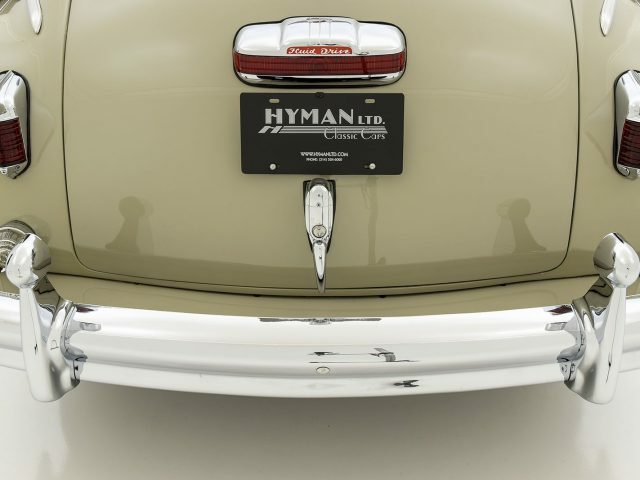 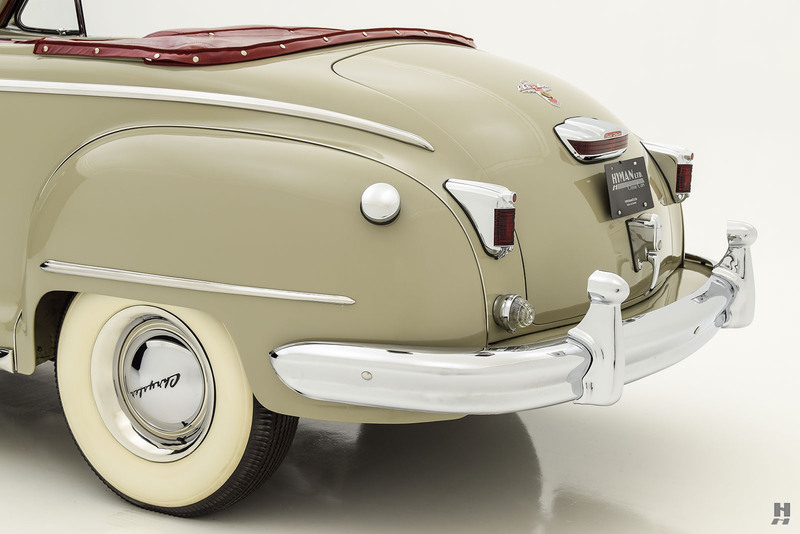 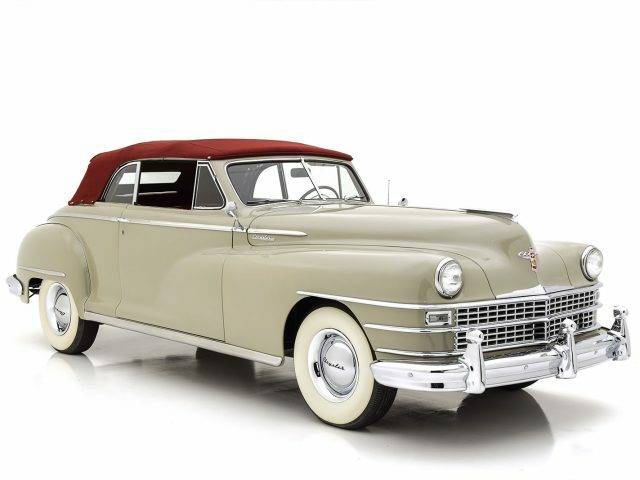 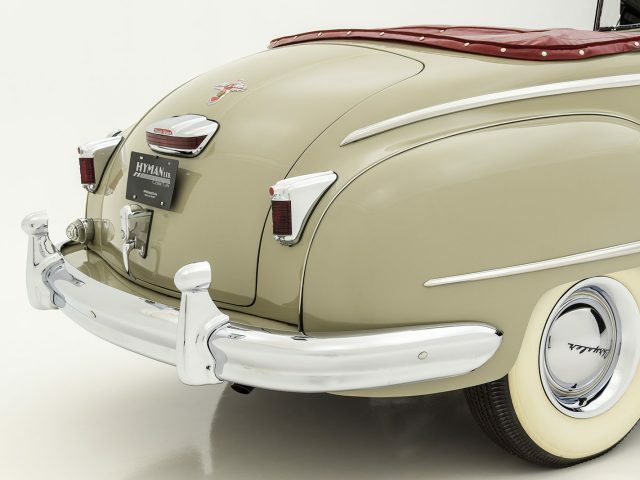 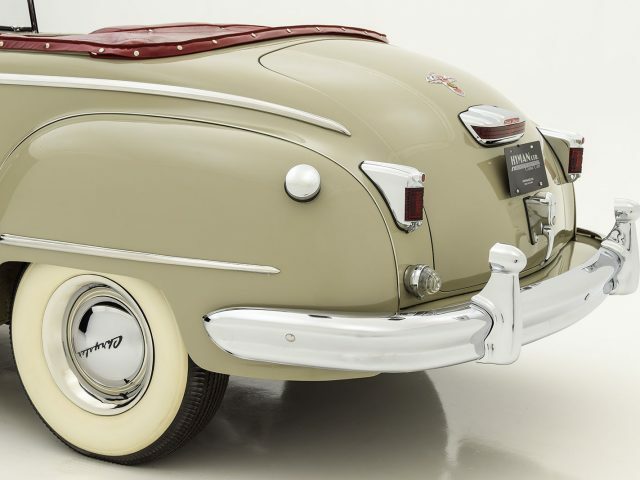 For the 1947 model year, the cars carried over virtually unchanged from before. 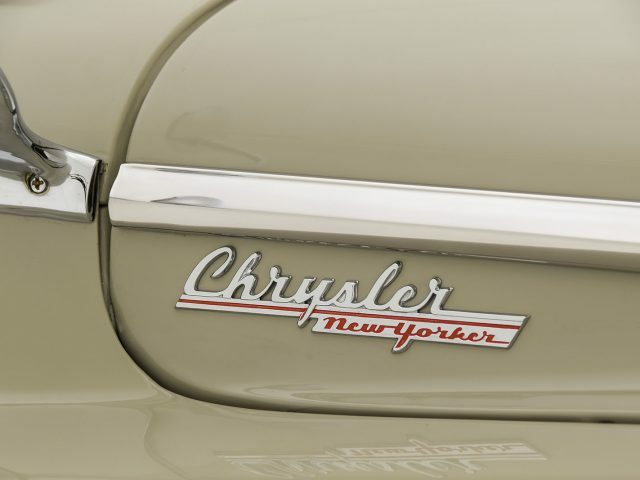 The New Yorker continued to lead the Chrysler line in terms of luxury and refinement. 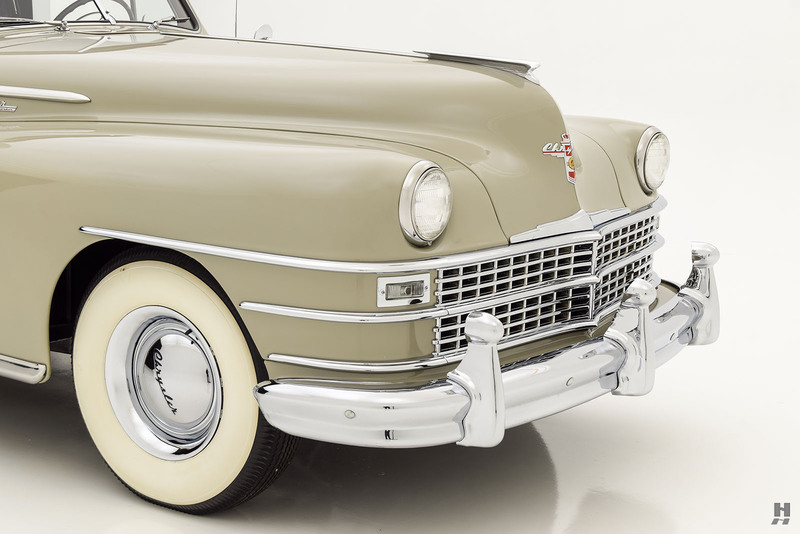 The Town & Country was only available on the New Yorker platform as a convertible, as all sedan versions were now based on the six-cylinder Windsor. 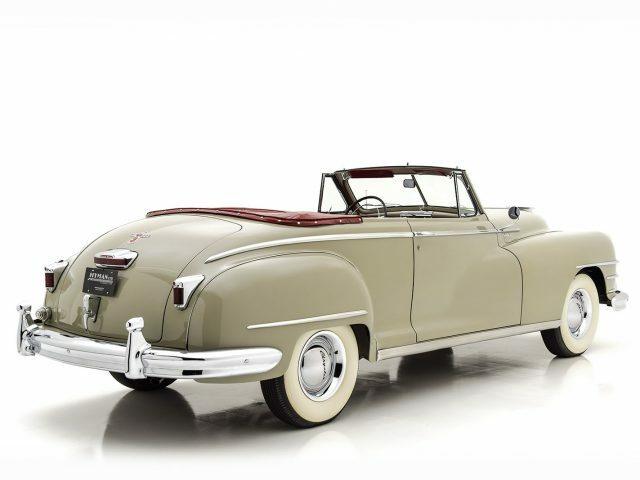 With the smooth and torque-laden inline eight, semi-automatic Fluid Drive transmission and excellent build quality, the Chryslers of 1947 are some of the best driving and most desirable American cars of the early post-war era. 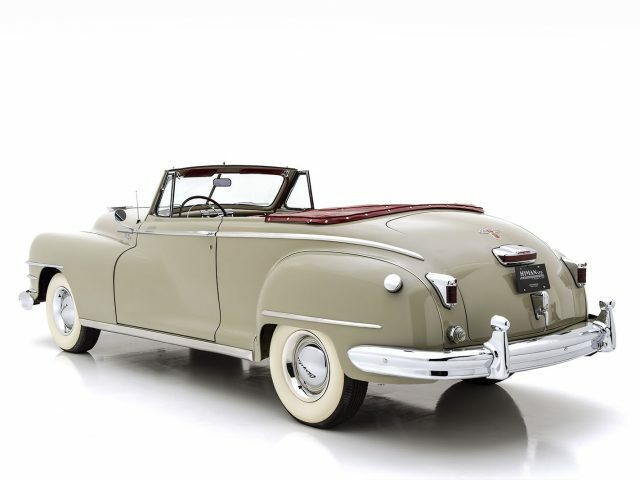 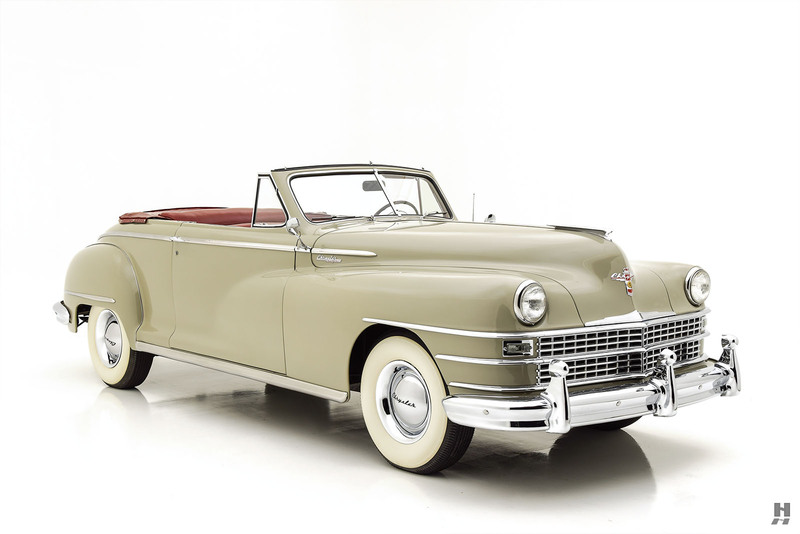 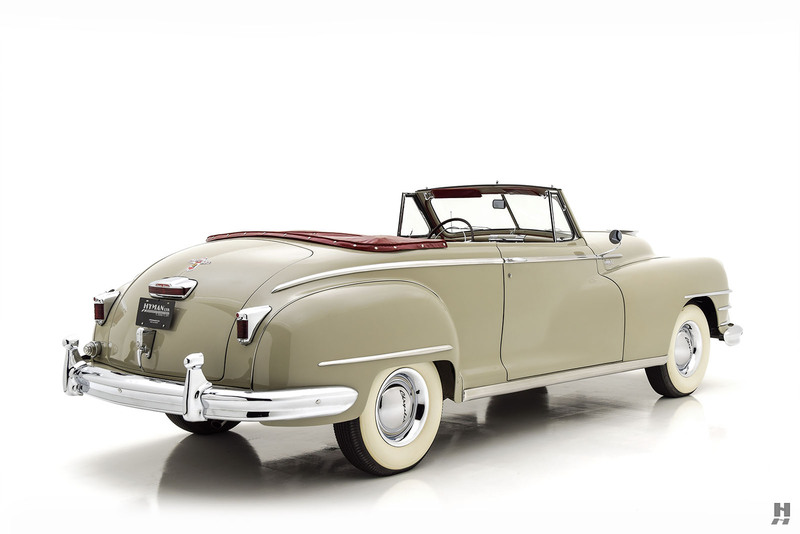 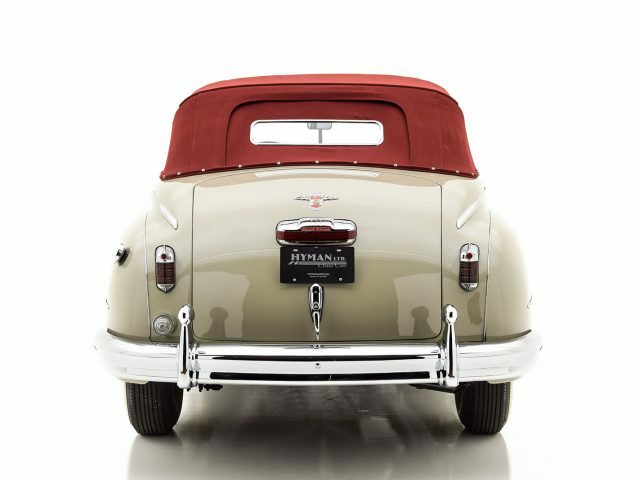 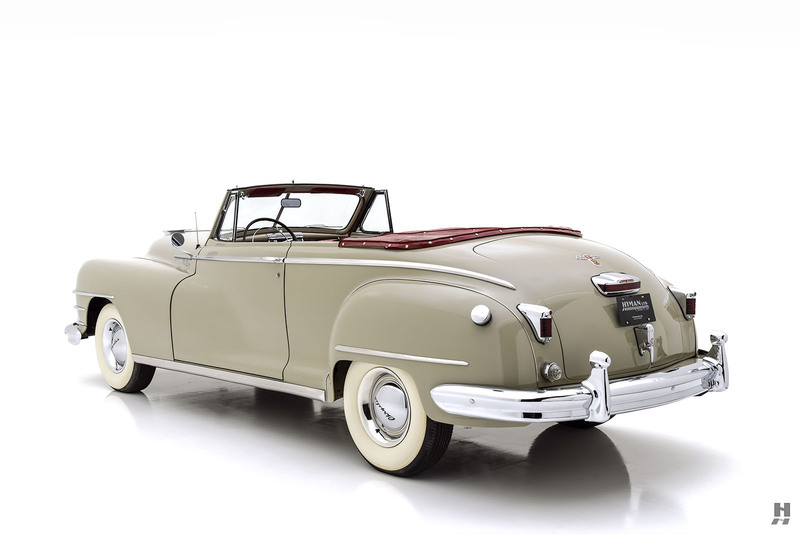 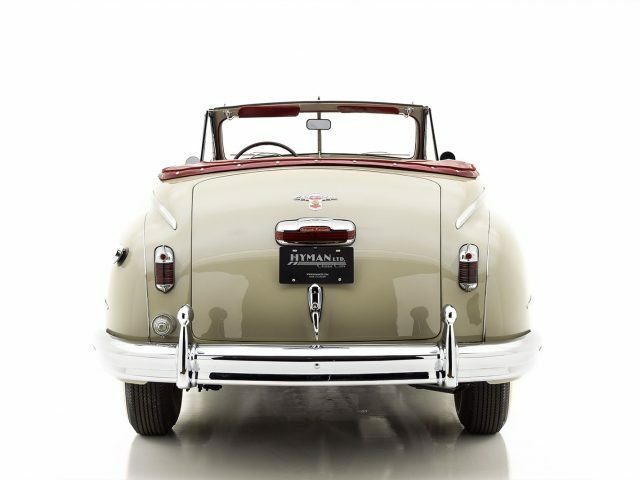 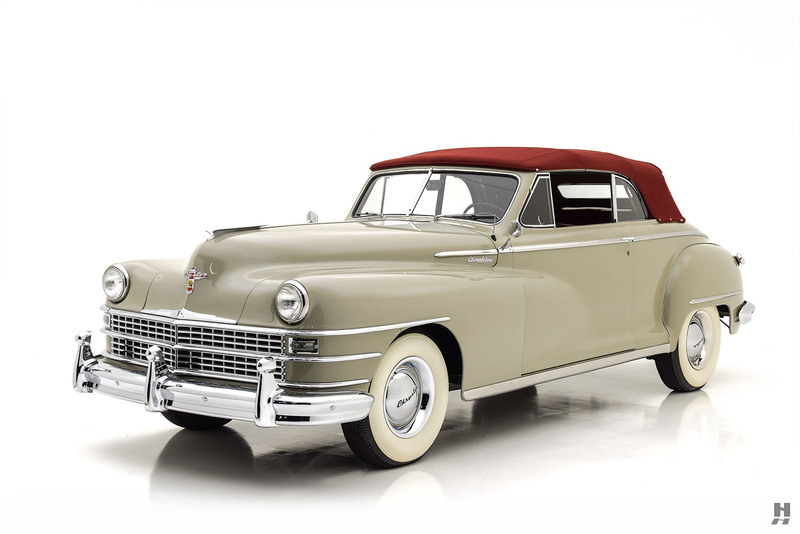 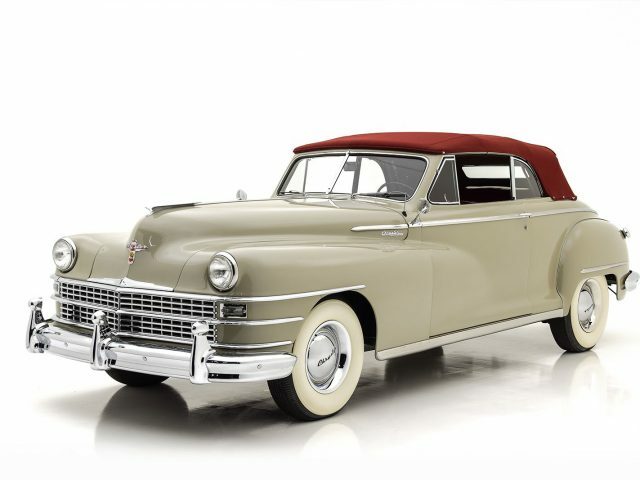 This handsome 1947 New Yorker convertible is a marvelous example of Chrysler’s stylish flagship. 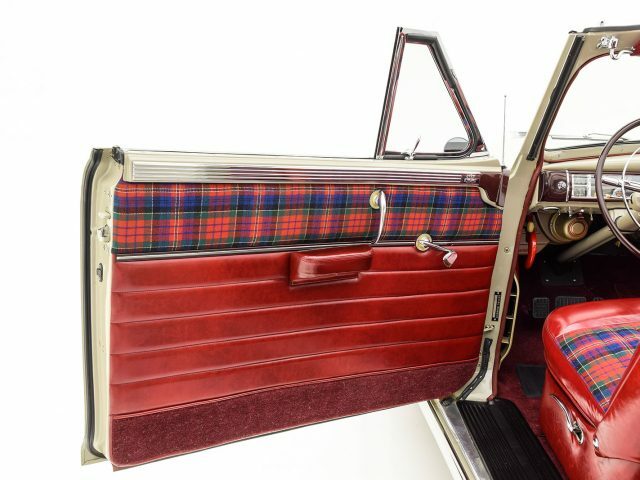 Highly-optioned, it features the distinct Highlander package and other desirable factory equipment. 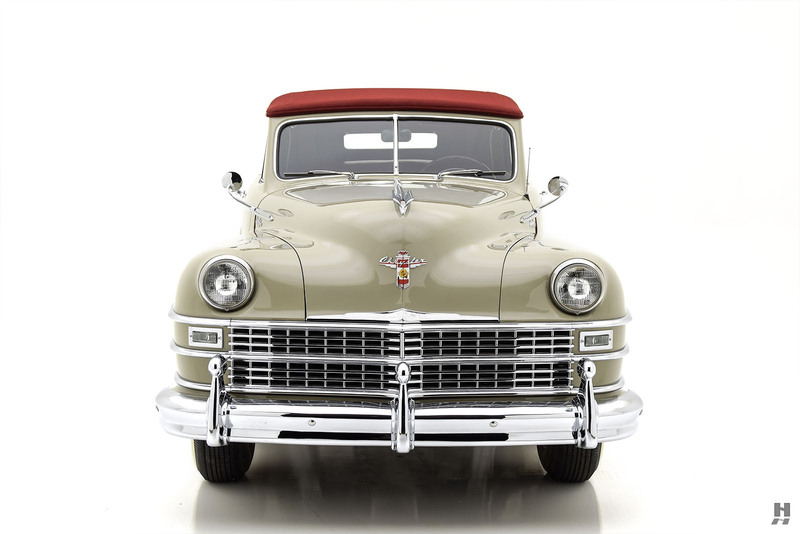 This car has a well-known history from new, being first sold in Montana and remaining with the original owner until the 1960s. 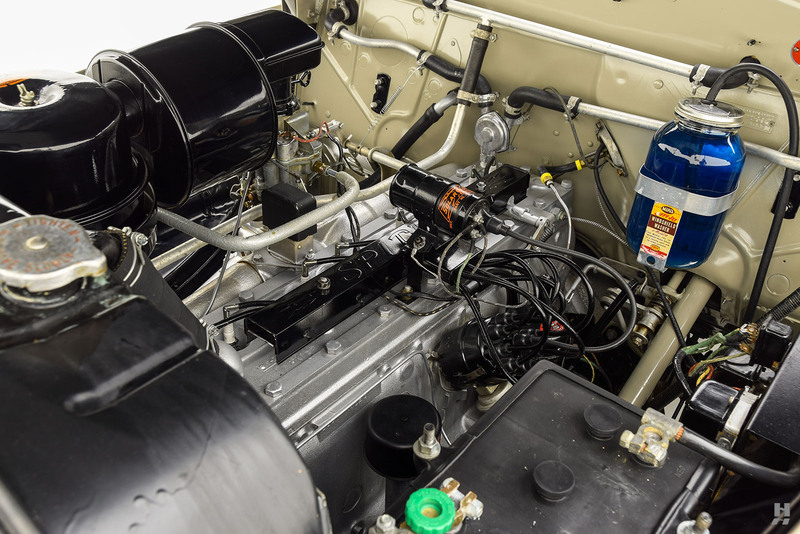 From there, it passed into the hands of an enthusiast and collector who had the foresight to preserve the car, enjoying it sparingly and carefully over the next 32 years. 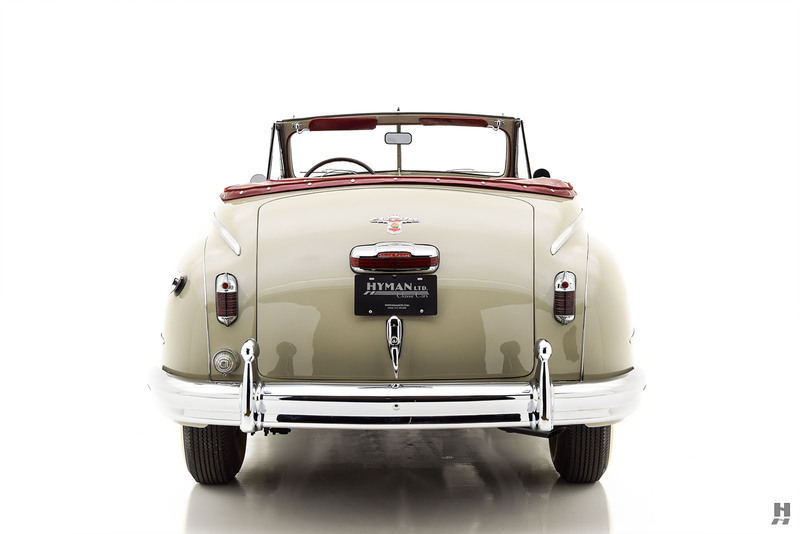 In the early 2000s, it received a comprehensive restoration finished to a very high standard. 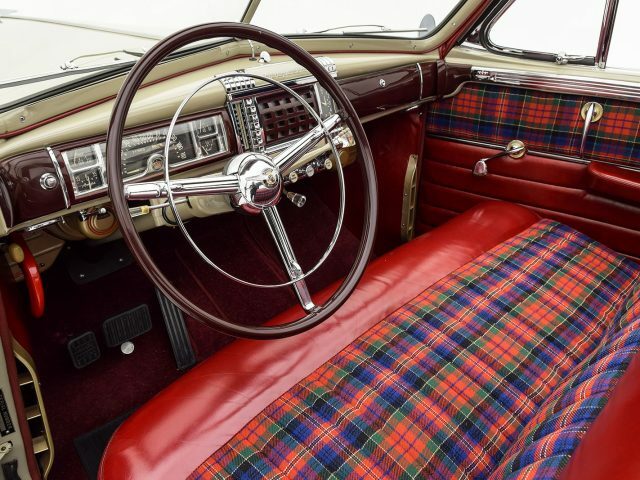 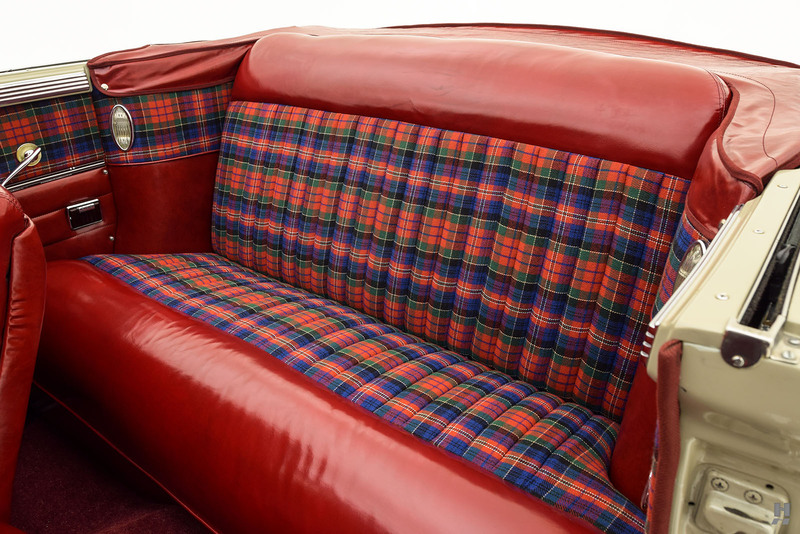 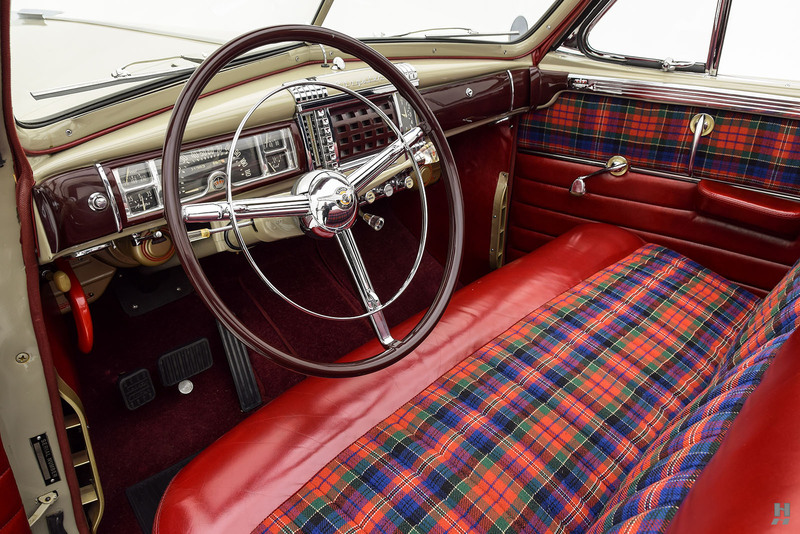 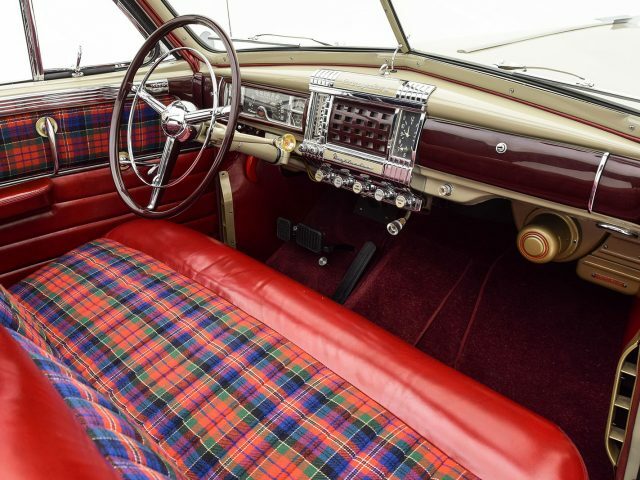 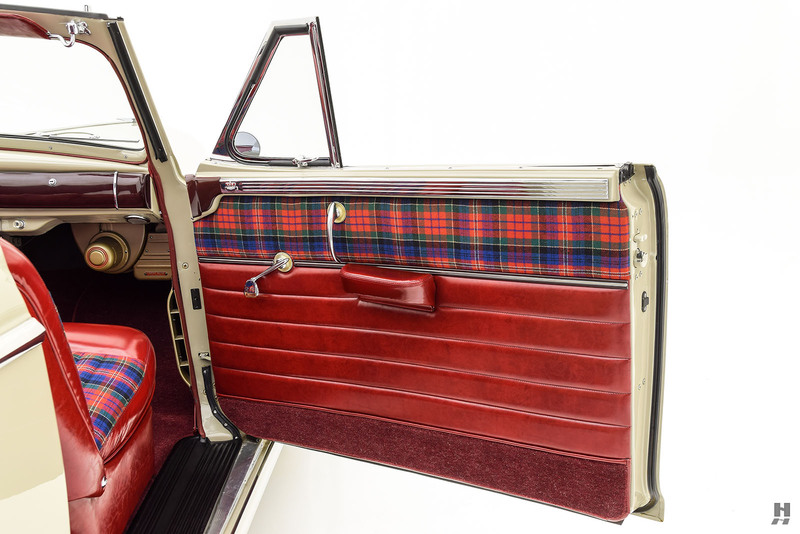 The process included a full rebuilding of the mechanical and electrical components, as well as a body and interior restoration finished in the original colors of French Gray over Highlander tartan cloth and dark red leather. 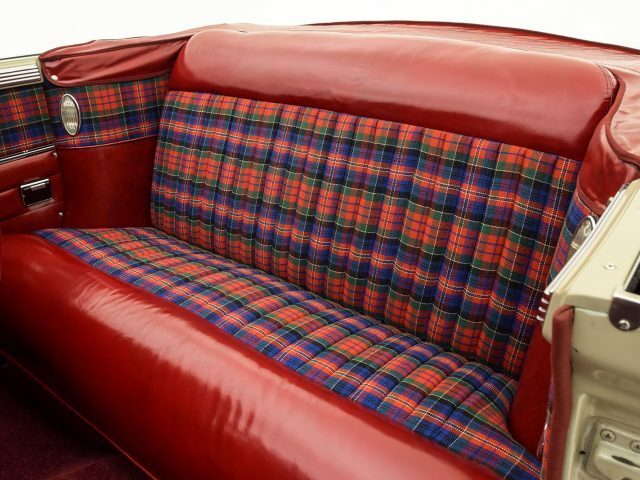 The current owners have continued to cherish and care for the car, and the restoration has mellowed gently with care and enjoyment. 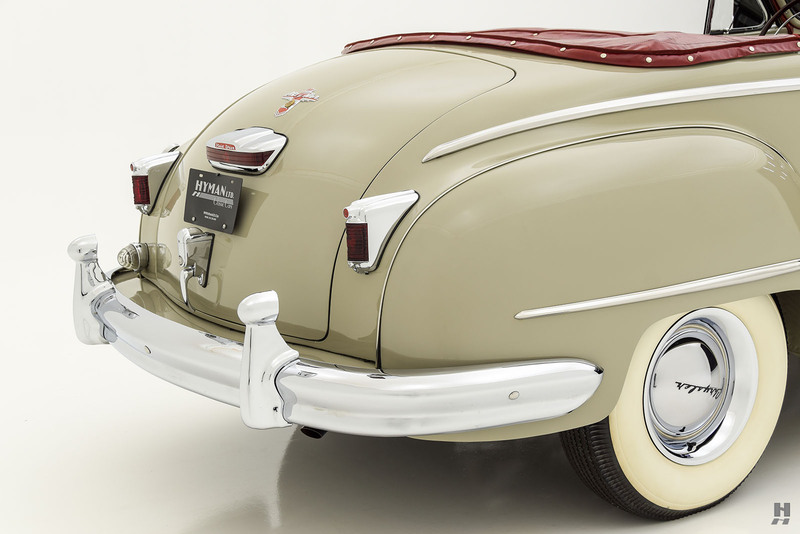 The warm shade of French Gray suits the shape beautifully, and the paintwork remains in excellent condition for its age. 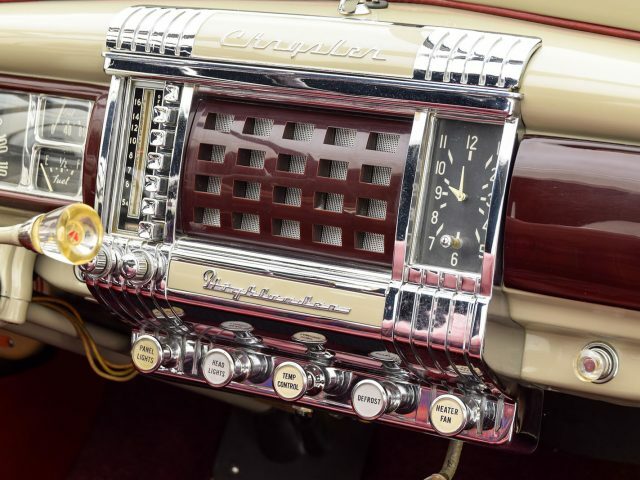 During the restoration, all of the original stainless trim was removed and polished, and all of the chrome replated at considerable expense. 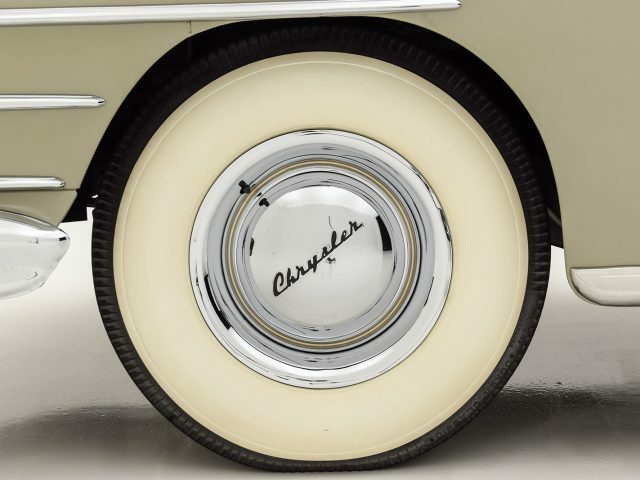 Like the paint, the brightwork is lovely and crisp. 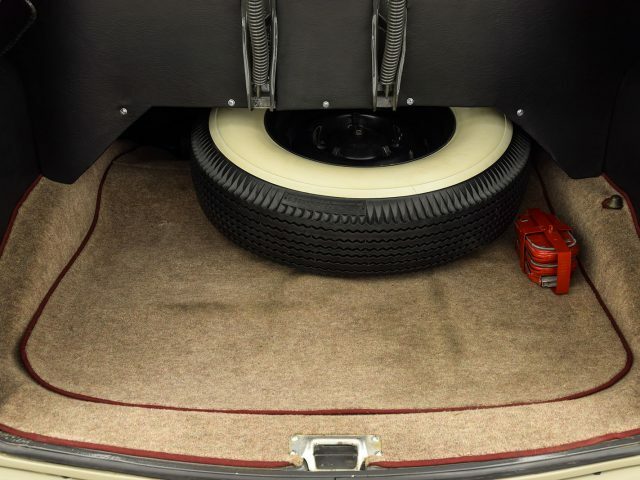 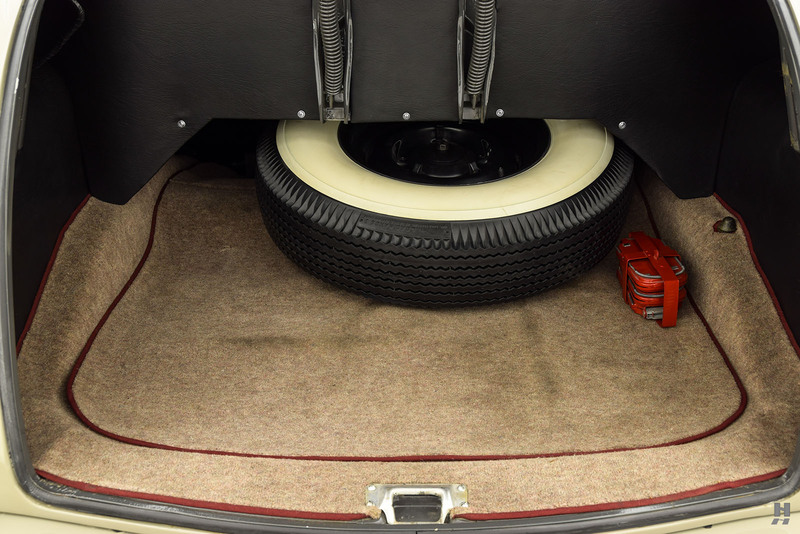 The car rides on correct-style wide whitewall tires and steel wheels with full deluxe trim wheel covers. 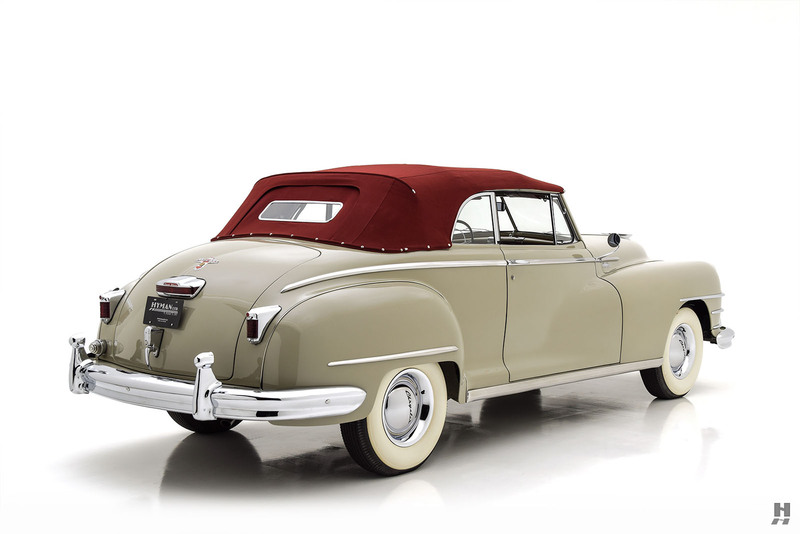 Accenting the gray paint is a beautiful burgundy canvas top, making this Chrysler equally handsome with the top up or down. 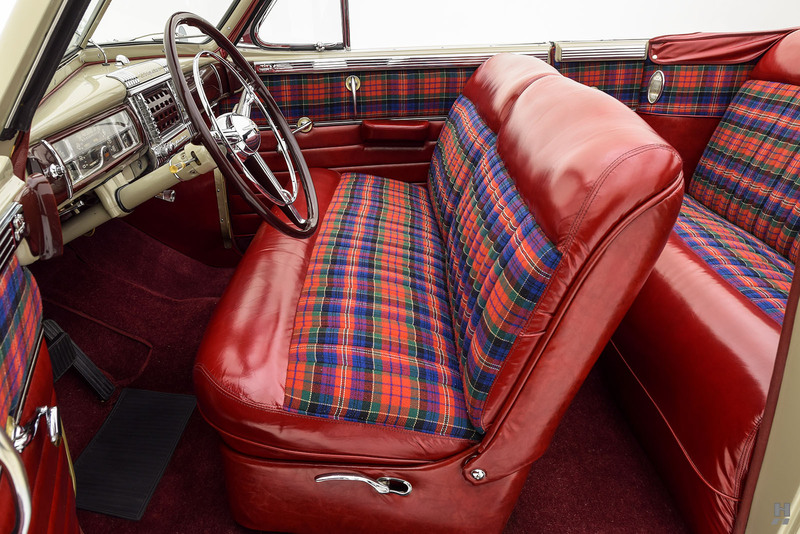 Occupants enjoy plush accommodations in the six-passenger cockpit. 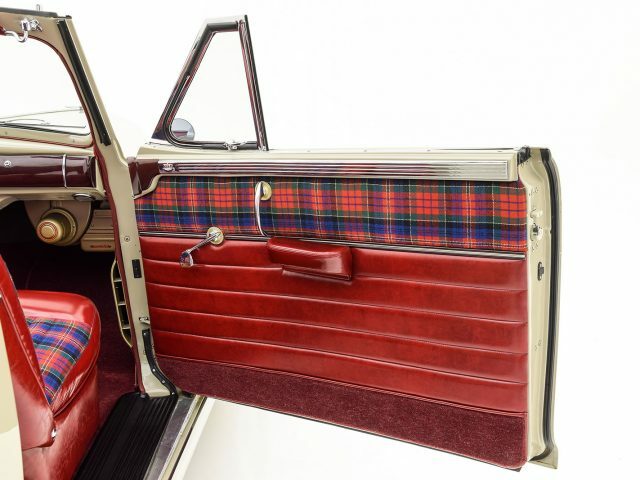 The distinctive Highlander trim adds red tartan fabric inserts to accent the oxblood leather on the seats and door panels. 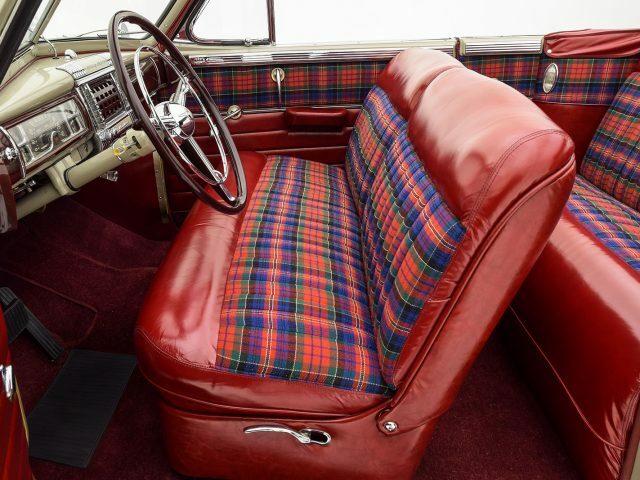 Burgundy carpets match the color on the dash, door caps, and steering wheel to round out the color scheme. 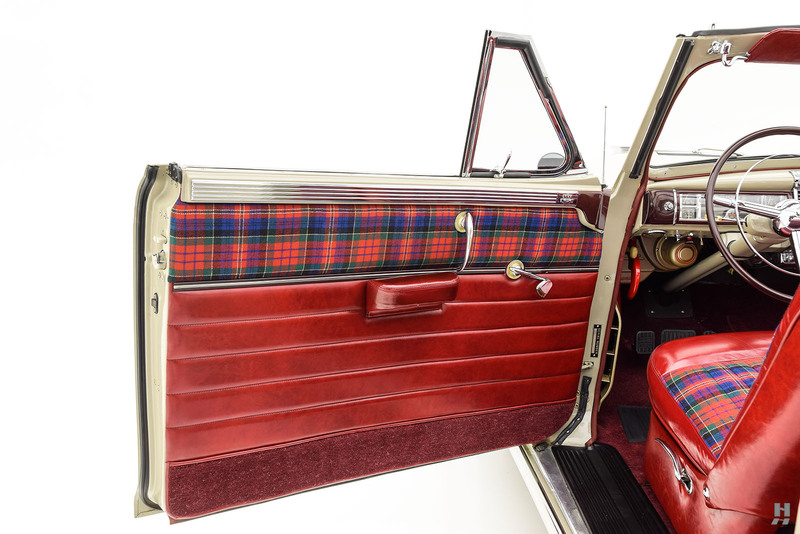 For the seats, panels, and top boot, the restorers used proper glazed leather to achieve the factory-correct appearance. 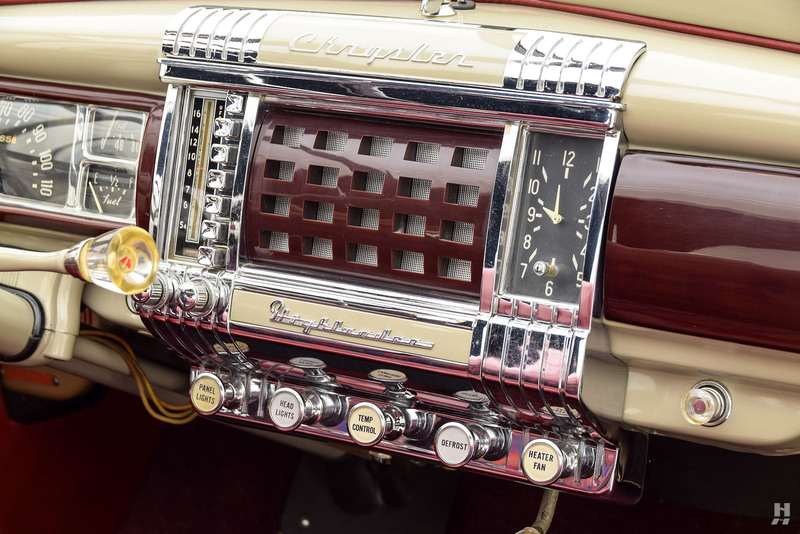 This car is well-equipped with an 8-tube radio, electric clock, and dual deluxe heaters. 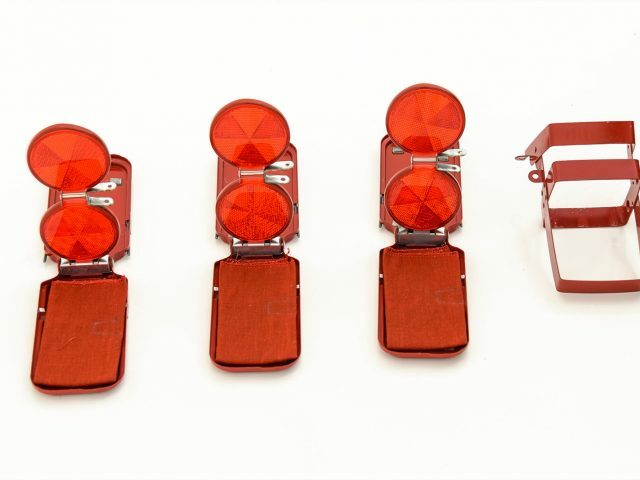 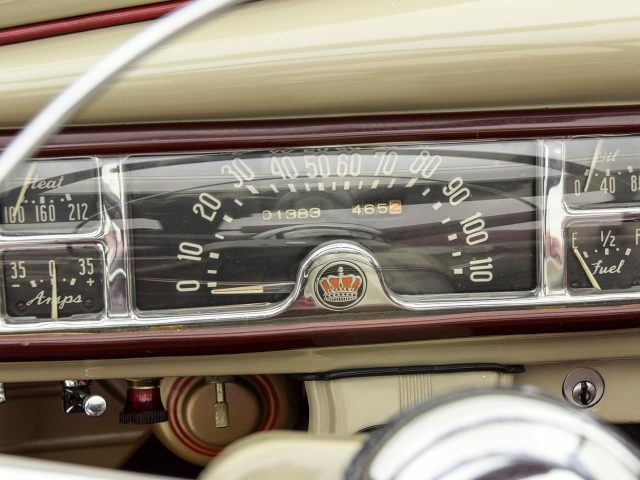 Instruments and controls are set into an ornate and beautifully stylish dash, finished in two-tone gray and burgundy. The quality of the restoration is outstanding, and it is clear this car has lived a charmed life in recent years. 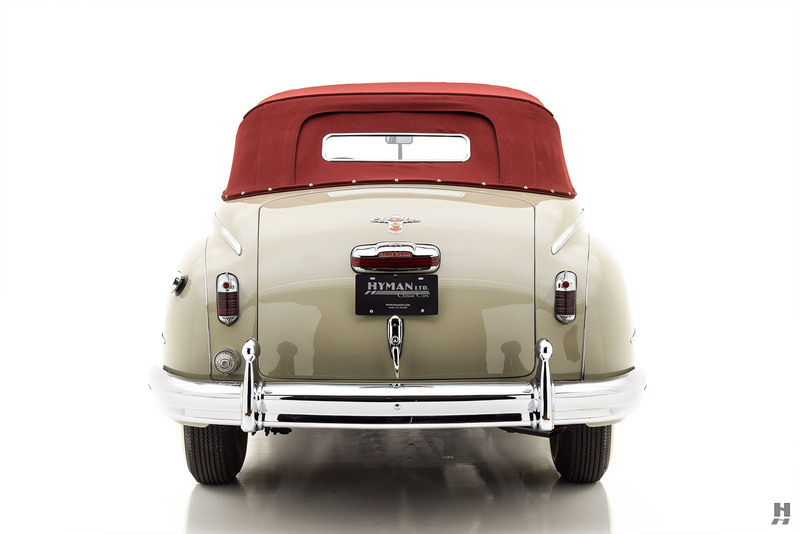 Under the hood rests Chrysler’s “Spitfire” eight. 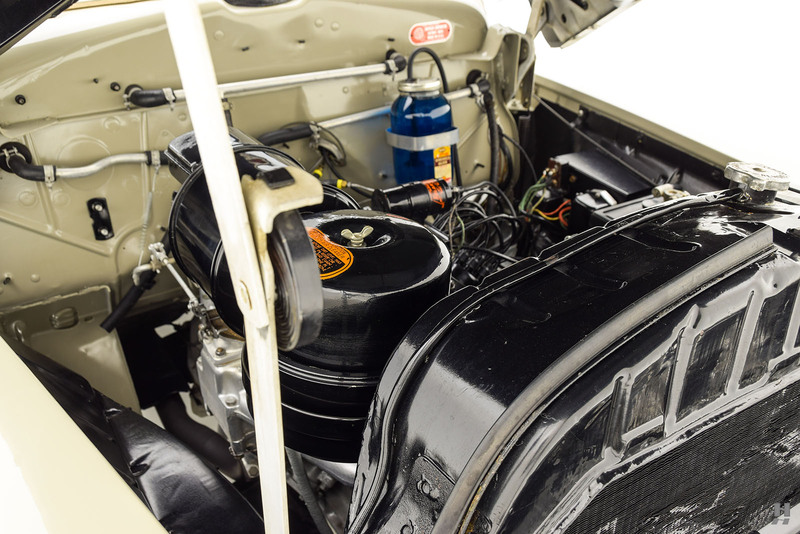 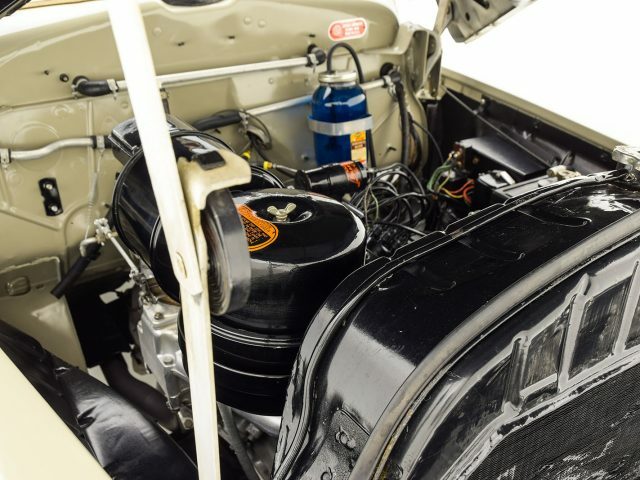 While the flathead unit is not known for big horsepower (about 135 horsepower from 323 cubic inches), the Spitfire makes enormous amounts of low-end torque and is about as bullet-proof as automobile engines get. 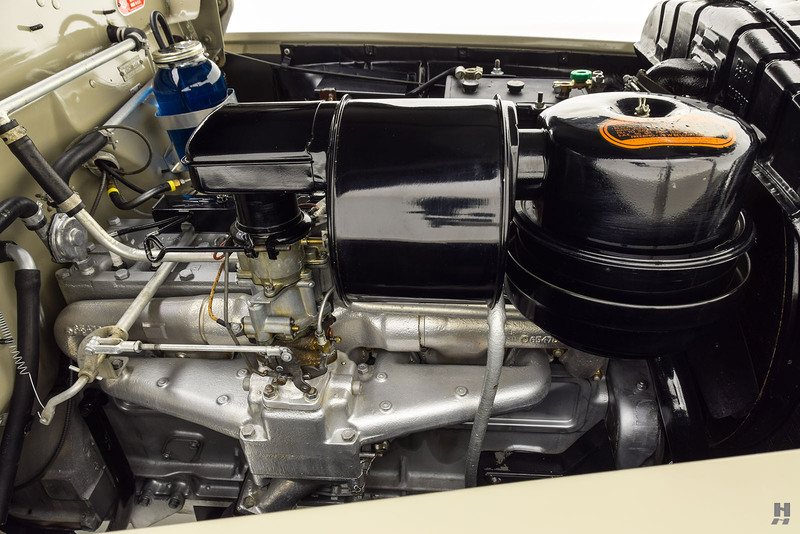 When paired with the Fluid-Drive transmission of this example, the combination makes for effortless cruising on a wave of torque. Reportedly rebuilt during the restoration, the engine runs strong. 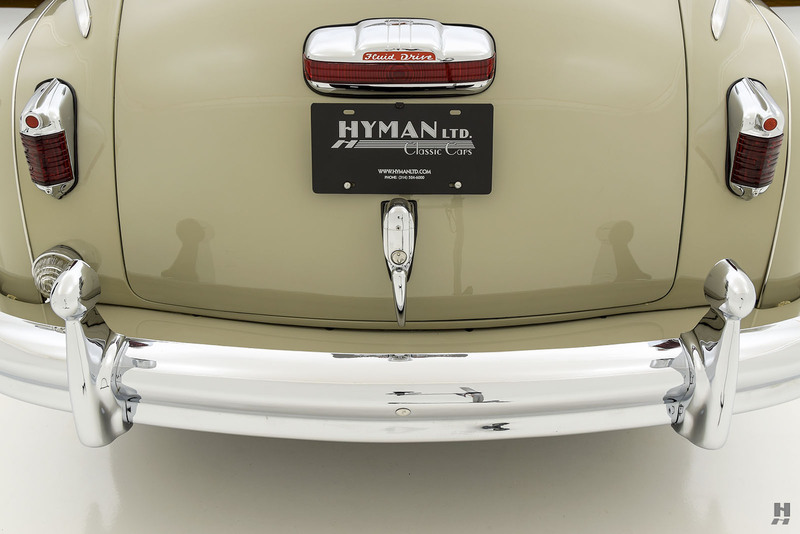 The presentation is very good, showing some light patina from heat-cycling on the manifolds and exhaust. 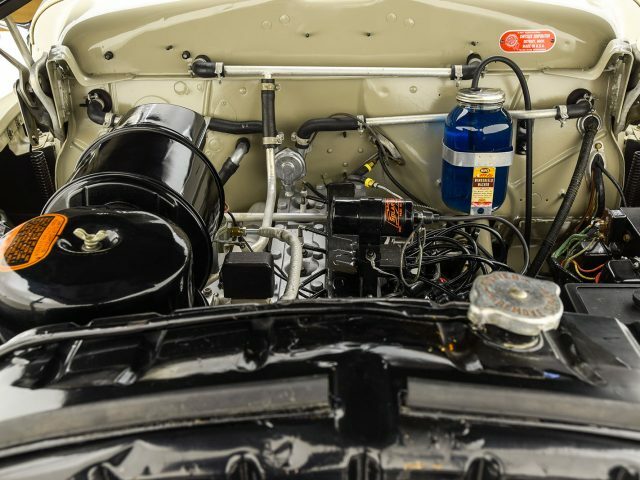 Details include correct decals, labels and hose clamps used throughout the engine bay. 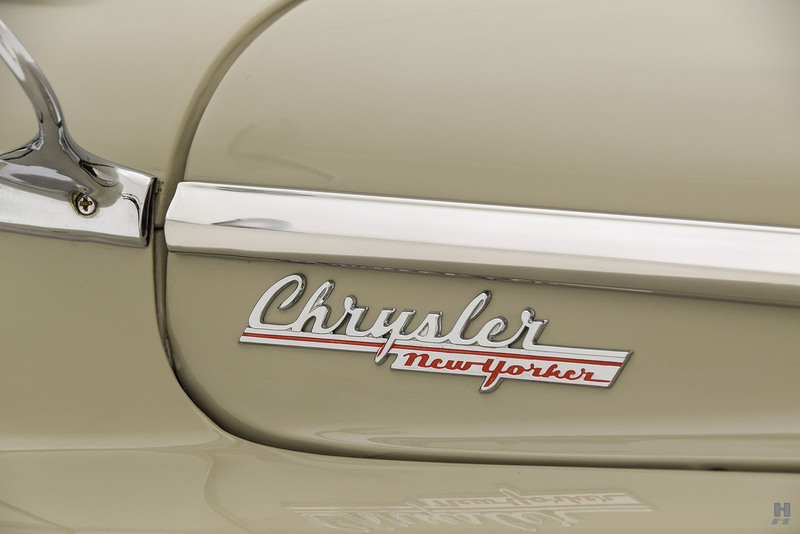 Rarely do we see Chrysler New Yorkers of this era restored with such a level of quality and attention to detail. 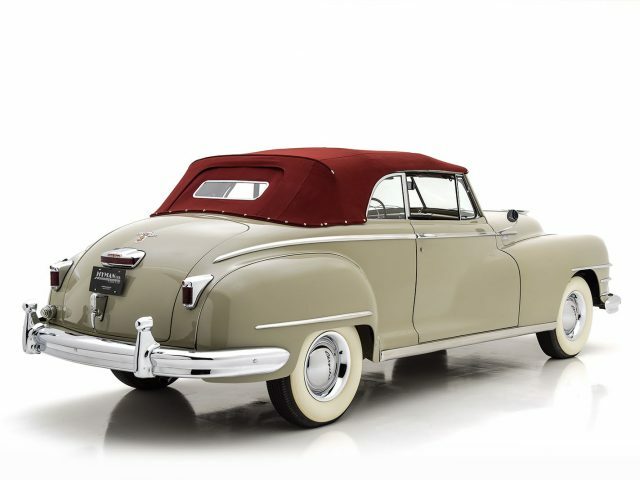 These cars are delightful to drive, and this example is beautifully suited to enjoyment on the road or for casual show. Carefully tended-to by a series of passionate owners for its entire life, this marvelous Chrysler is sure to charm its next custodian.